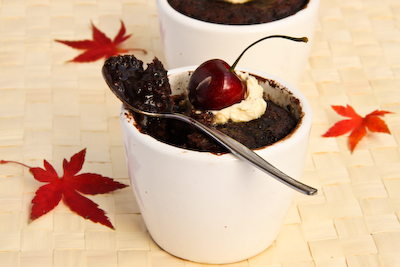 Self-saucing pudding. 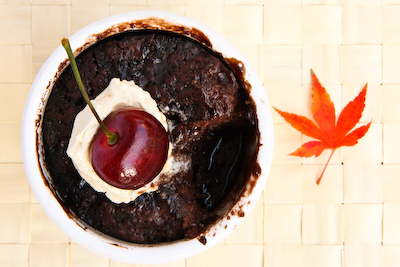 How amazing is self-saucing pudding?! It's no regular, run-of-the-mill pudding. It goes into the oven a big, sloppy mess and comes out as a fluffy, steaming delicious thing that is already sitting in its own sauce! I mean, does it really get much better than that? 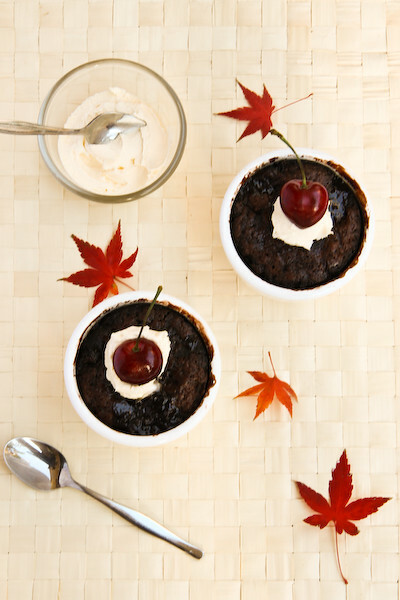 Stephanie Alexander's self-saucing chocolate pudding has always been one of my favourite winter desserts. But here is a fun, slightly boozy spin on the chocolate version. I have always been a black forest cake kind of girl. I know it's sometimes known as a bit of a daggy cake, one that some people might dread to receive as their birthday present. But I've always loved it. Cherries and chocolate make me happy, what can I say? 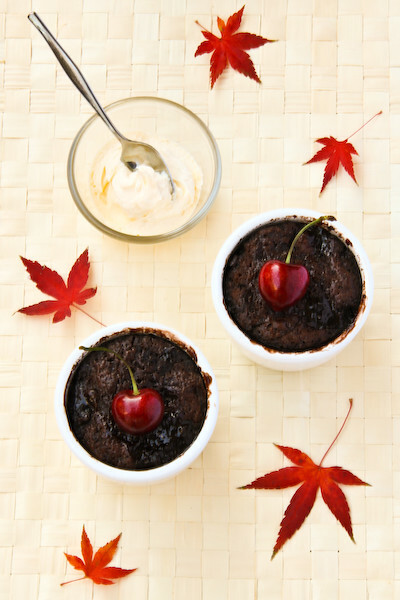 Adapting those flavours into a pudding like this isn't too much of a stretch, the flavour from the cherries and Kirsch adds a lovely fruity depth to the pudding. Especially with that gooey, rich chocolate sauce (using Dutch process cocoa powder is a must, regular cocoa will not do!). Usually I make self-saucing puddings in one big cake tin, which is great fun to scoop out big spoonfuls of pudding and sauce out of, but this time I thought I would try splitting them up into separate servings. It works just as well, and is a lot less ugly, as long as you make sure you split up your pudding and topping mixture evenly between each of the servings. I even managed to get my hands on some fresh cherries (for a ridiculously high price) to serve with the fresh cream. 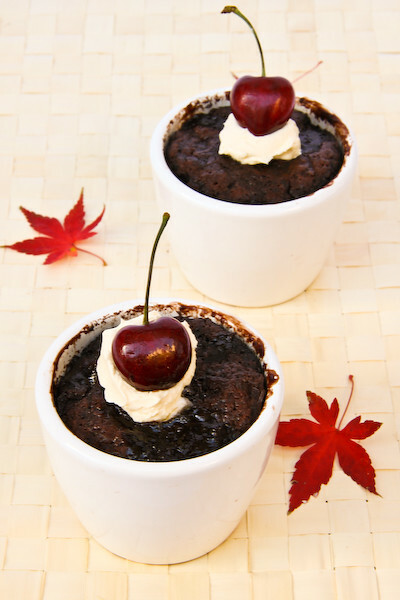 I have to say, digging my spoon right into the bottom of these puddings, to get a taste of the cake, sauce, cream and cherries all in one mouthful is total bliss. And if you're not into boozy puddings, you can always replace the Kirsch with water. Preheat oven to 180 degrees C. Grease four large ramekins with butter (or a 20cm square cake tin, or 6 medium ramekins). 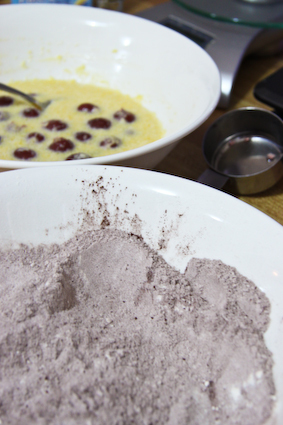 Sift flour, cocoa powder , sugar and salt together in a bowl. In a separate bowl, mix together milk, butter, vanilla and egg. Add wet ingredients to dry ingredients and mix to combine. Fold in cherries. 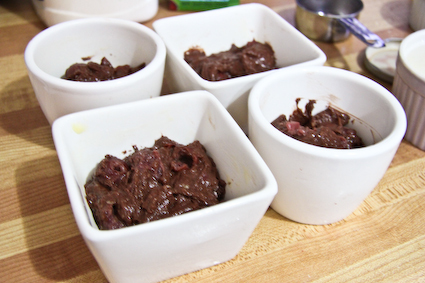 Pour into greased ramekins, evenly divided. Mix brown sugar and cocoa powder and sprinkle over the top of the pudding mixture, also evenly divided between each ramekins. Mix water and Kirsch together and pour even amounts over each pudding. 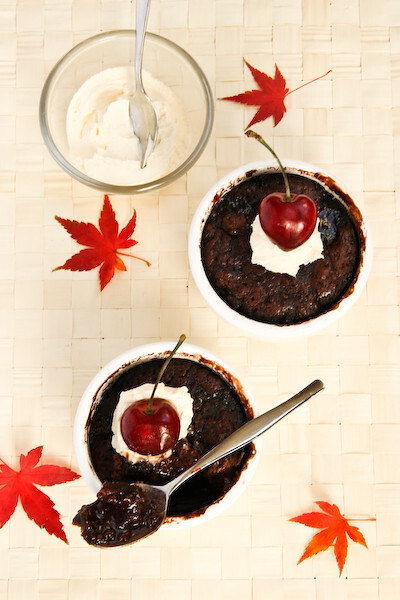 Bake for about 30 mins, or until the puddings are firm to the touch and the sauce should be bubbling around the edges. 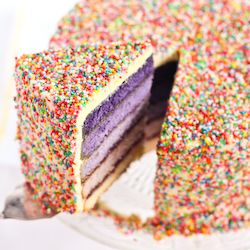 (Will take about 40-45 minutes if baking in single cake tin). Remove from the oven and cool for a few minutes, then serve warm with whipped cream or ice cream and fresh cherries. If you're sitting there wondering what's going on with all the leaves; I couldn't help grabbing a few of them from the tree outside my house. I've always loved seeing all the trees as the leaves are changing cover on my old street where I used to live. The trees were all perfectly spaced to lean over and create a gorgeous leafy tunnel all the way down the street. And though I don't live by that street anymore, whenever I see the leaves on the trees changing colour I always think about how pretty and magical that street looks at this time of the year :) Roll your eyes at me if you want, I'm a sucker for it! i cant believe you, these sound stunning, so stunning. Ooh I love self-saucing puddings! So good when they're warm and straight out of the oven on these chilly nights! I like the colour of those autumn leaves too :) Where do you get your Dutch process cocoa from? Whatever you make... I want! Yum! Oooh cherry!!! I don't care how daggy it is - anything black forest is divine and people haven't lived if they haven't tasted the combo. Esp in a fudgy saucy pudding. YUM. How gorgeous would these be on a cold wintery night? Bonus points for the boozy content. Kirsch me up! Great idea! Making me drool just thinking about them! You'd certainly make Ms Alexander proud with your version Steph - if she ever got her hands on your version she'd be kicking herself and wondering why she didn't think of it herself! I've never made self saucing puddings! But I've been hearing so much about it recently that I'm now super tempted to try it too. 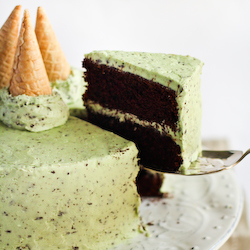 Oh my, I think I'll have to try this, black forest cake is my hubbies favourite but this might be the new fav. Looks marvelous! mmm pudding. totally what i need right now think my fingers are about to fall off in this cold. also, i really love the leaves. 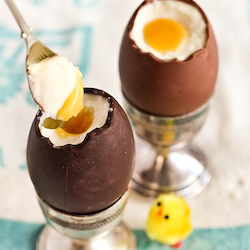 Yum - I am so making these this beauties week! And replacing the liqor with water? Where's the fun in that?! Not a big fan of black forest nor puddings, but really wanted to let you know how cute (and appropriate) those autumn leaves are! Laura - Thanks so much! Amy @ cookbookmaniac - Haha yay that's a good thing! Thanks! Emma @CakeMistress - They were so good, especially since it's been SUPER cold recently! Hehe gotta love boozy puds! Here Comes The Aeroplane - Thanks! Trissa - Haha I hope so! I heart her! chocolatesuze - I know, it's ridiculously cold for Sydney isn't it. :) thanks I love them too! Forager - Haha exactly! Water instead of booze is for boring ppl! mademoiselle délicieuse - Aww thanks!! I knew I had to use them in a post after walking past them everyday before work! FFichiban - LOL ok :P Let me know if you try it!! Oh yum, these are great! I'm a dag in many respects so I'm not ashamed to admit liking these flavours :D Love those leaves too. One day I'll have a pretty Japanese maple in my garden! Thank you!! Go the dags :) I want one too! I get it from The Essential Ingredient in Sydney. I've also seen in at the David Jones food hall. But regular cocoa powder should work fine too! Very good, I also tried reducing the brown sugar down to 100grams and using the juice from the cherry's (heating it to boiling first). This made it extra yummy!!! 180 grams of brown sugar??? Too, too much. 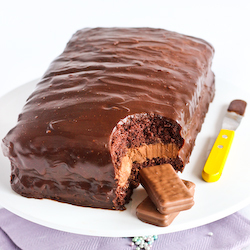 I'm making this now....certainly going to reduce the amount of brown sugar!